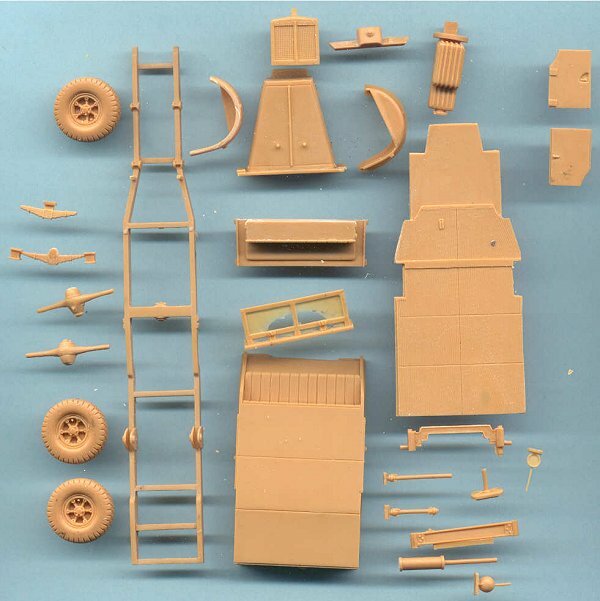 The kit comes separated into a ziplock bag of truck parts and one bag of 88-mm Flak gun parts; all in a cardboard box which is all typical of MarS kits. There are approximately 80 tan resin parts (there were actually so many tiny parts I gave up counting them). Resin casting is the typical crisp, superb MarS quality. Clean-up of pour plugs and sprue was not to bad. Be very careful to wet-sand all parts flat and true. Above is a photo of the partially assembled truck chassis & body. Holes need to be CAREFULLY drilled on the rear springs for the rear axles (the rear suspension in the photo above is before the holes were drilled but it shows you where to drill). The instructions are not clear at all in how to handle the rear axles and wheels, what I chose to do was to carefully drill all the way through the suspension and slip the wheels on (after drilling holes in the wheels). The instructions above are decent and certainly better than many other manufacturers and no instructions at all (no instructions are common to too many resin kits), but too many parts of this MarS kit are not portrayed and it is unclear as to where the go exactly! 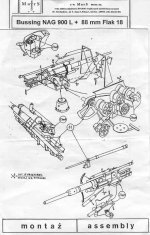 Above is a scan of the 88-mm Flak-36 assembly instructions. This is the same mount as on the towed version of the gun minus the cruciform stand. 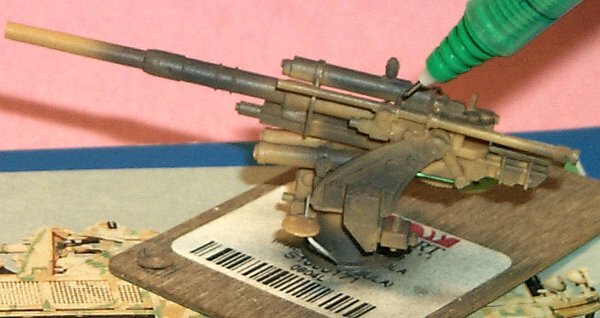 This gun is markedly superior to Hasegawas Flak 18 and Flak 36 kits in both detail and accuracy. Above are representative gun parts (again this is not all the parts). Detail is superb. MarS is certainly a company to compare most other resin model companies against. The few long parts in the center of the scan that are a little warped can be straitened in very hot water and on a flat surface. Some of these construction tips apply to any plastic or resin model. This vehicle is similar to the Vomag truck version but different in many important and visible features. Photos of the Vomag version show it without the large shield as its primary purpose was Flak protection in the Fatherland rather then in a ground role. I opted to leave the shield off this model though if we find evidence they did mount a shield it should not be hard to mount it later. The back of the six wheels need to be sanded down flush and holes drilled for the axles. Cyanoacrylate (Super Glue) was used for most of the assembly. Some of the parts (like the body & frame) needed some moving around to get them centered, with these parts a 5-minute epoxy glue is recommended. If you make a mistake, nail polish remover with acetone can release the glue if you act quickly. Caution: the acetone can also soften the resin a bit and it is toxic too! White glue, such as Elmers brand, should be used for items that may need adjusting later. Parts possibly needing adjusting later are the wheels and rear wheel assembly in case the rear tires do not sit flat on the ground. The kits design is such that the rear wheels can be made to articulate over rough ground. Almost no need to scratchbuild new parts was found though several thin parts broke and disappeared to small-model parts limbo so they were replaced by brass and copper wire. An exception to this was the footrests for the two crew seats. MarS sculpted these as flat bars when in all the photos I have seen they are steel rods in a T-shape. I crafted new footrests with thin styrene rod. Drill holes in the rear leaf spring assembly for the axes to go through and into the wheels (remember those holes you drilled in the back of the wheels?). Assemble the kit and paint the primary colors in stages or subassemblies. 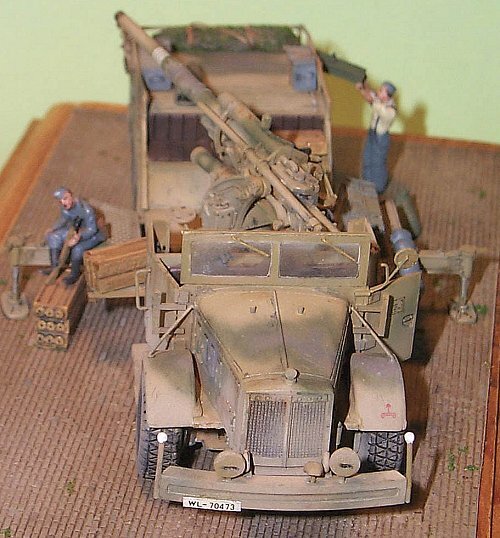 For example: build the truck and the Flak 36 separately and do not glue the gun to the truck bed until after painting but before final weathering, paint the wheels before gluing them to the axles. Mask off areas that are later to have glue on them. Do not install the clear windscreen to the windshield frame until after painting the frame. Then install the windshield wiper. In these photos of the partially assembled kit I primed some areas with dark gray with the intention of scraping off the dunklegelb base coat in places to simulate more realistic chipping and wear. Unfortunately this method did not work well for me this time. The paint came off right down to the resin. The salt-technique would have been much better. These vehicles were reported to have been built in 1944 so would have a dunkelgelb (dark yellow) base color, and possible a green and brown camouflage scheme applied in the field or at the factory. The Vomag versions were built prior to 1943 so should have initially a panzergrue (gray) color unless repainted in 1943 (I understand that not all rear area vehicles were repainted to the 1943 dark yellow standard. Carefully wash the model with warm water and dish soap (over a screen or fine colander to catch small parts that fall off). Rinse well and let air dry. To create any future chipping and scratching the completed model was primed with a dark gray enamel primer so after the final painting it could be lightly scratched with a blade to reveal the contrasting gray below (see above photos). The gray primer was not sprayed over the entire model, only those places subject to wear and scratching (see photos above). Not geared to land combat, the truck likely stayed on roads and not subject to the abuse tanks went through. Two light coats of Model Master Dunkelgelb acrylic paint were applied over the primer. A point-wash of brown, and black artists oil washes with a base of turpentine (I love the smell!). With this wash its critical to use acrylic paints; the turpentine will cause enamel paint to blister and peal. By point wash, add the dark wash around the hinges and in recesses, do not paint it over the entire model. After the wash had cured several days, I sprayed on light coat of the base yellow to blend in the wash to get rid of "the dark rings", the bane of excess wash. Following this I applied the camouflage pattern of gray patches with brown edges. I have no photos of this vehicle so the camouflage pattern is totally "artists license" with no apologies. The markings came next. In this case: extra Hasegawa license-plate decals over a gloss of acrylic floor wax, and an Archer dry transfer unit marking over the flat paint. After a dull-coat on the gloss areas a light spray tan over lower areas to represent dust and blend the model into the base. While on the discussion of weathering and dust I have to interject an observation after reviewing over a hundred photos of WW2 era softskin windshields. I find it so common on softskin models to have bare "wedge or windshield-wiper shaped" clear areas on an otherwise filthy windshield glass. Yet, in the photos I found only about one or two out of 100 windshield that had these clean wiper-shaped marks, thats only 2 to 3 %. Most windshields had clean windows, or were dusty with a clean circular area where it looks like the windshield had been wiped by a rag. I suspect this is because in the 1940s they did not have windshield washer sprayers, and using the wiper on a dry dirty windshield is a good way to scratch it up. Its pretty common to see these clean wedge (windshield-wiper) shaped areas on softskin models though, say 50% of models I have seen. In 2002, a truck model of mine was weathered with only a clear circle in the windshield, only to be faulted by a contest judge for having paint "overspray" on the windshield edges. Perhaps my technique was not as convincing as it should have been? On this MarS truck model I opted for the wedge-shaped windshield clear spots though now regret it with a feeling of caving-in to peer pressure. Perhaps we as judges need to think "out of the box" more. I advocate that we not fault for adding these shaped areas and do not fault for leaving them off, only judge how well they are done. An art teacher of mine many years ago told me "Before you can paint, you first must learn to see." I believe this applies to modeling as well. Now I will get off my soapbox (an American term for preaching). In the photo above of the right side cab area, note the misalignment of the bottom of the drivers door with the center column; an fortunate assembly error on my part! 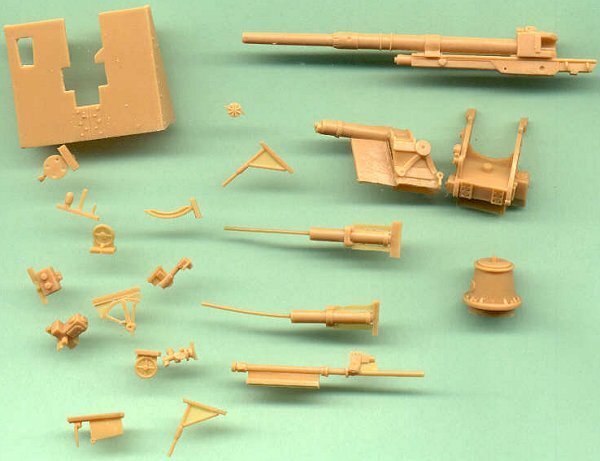 The figures and infantry accessories are from Preiser. 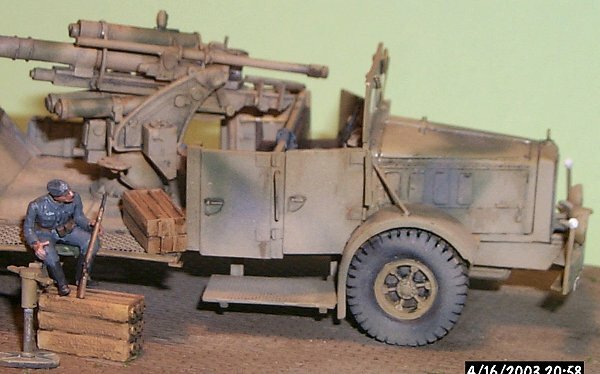 Though the kit comes with a nice gun shield, the earlier produced Vomag trucks did not have the shield and as the vehicle was designed as a rear area Flak unit, I left my shield off as well. In the front end photo above, note the black wash to the tire tread to add depth, the infamous clear windshield-wiper shaped areas on the glass. This was a great model of a unique and interesting vehicle that I highly recommend. It is very complex and has an imposing number of parts so it is perhaps better for an intermediate or advanced level modeler. Instructions could be better and several (not all) mistakes I made I can attribute to unclear instructions. I cannot say too often to dry fit as often as possible before gluing. Good reference photos I could not find for this Büssing Nag truck. 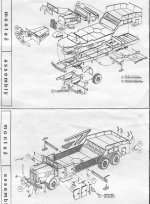 Except information with the MarS instruction sheet a number of photos and some information was found for the similar Vomag Flak truck only.